Welcome to Bookmarks XII. This annual series aims to encourage appreciation of work in the format of the artist's book. Participating artists each produce an edition of 100 signed and numbered bookmarks to give away through distribution boxes at 10 venues around the world. This year they are going to independent bookshops, art centres, galleries and libraries, including the world's smallest literature house (in Røldal, Norway). All venues are open to the public, in: Australia, Canada, Norway (three venues), the UK and USA. 475 artists have contributed 47,500 bookmarks to the twelve projects to date. 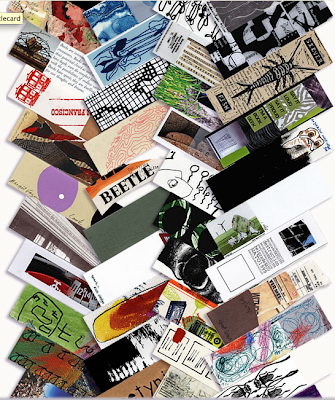 The artists' bookmarks are divided into 100 sets; one full set being sent to each of the contributing artists and the rest divided and sent in distribution boxes to participating host venues around the world, for visitors to take. Each bookmark has the website address which brings visitors here to the gallery of artworks online, in the hope that people will find out more about the artists' involved in the project. You can find the locations on the website as well as the bookmarks and short statements by the artists. Enjoy!